Skills and abilities: Proficient street Fighter. Born to the super humans Rapture (from another dimension) and Skullface. Like his father he had a deformed appearance which often ostracized him from his peers. 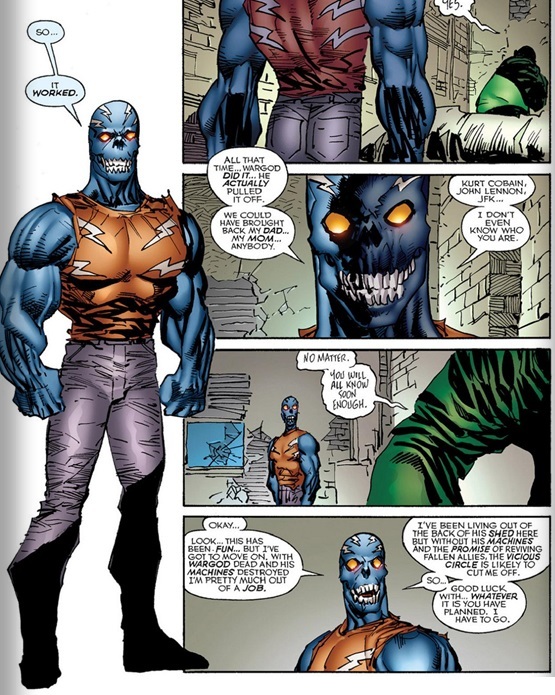 His father was a super villain and member of the the “Vicious Circle”, Savage Dragon’s most fearsome foes. Skullface was the right hand of Overlord the undisputed most powerful foe of Savage Dragon. 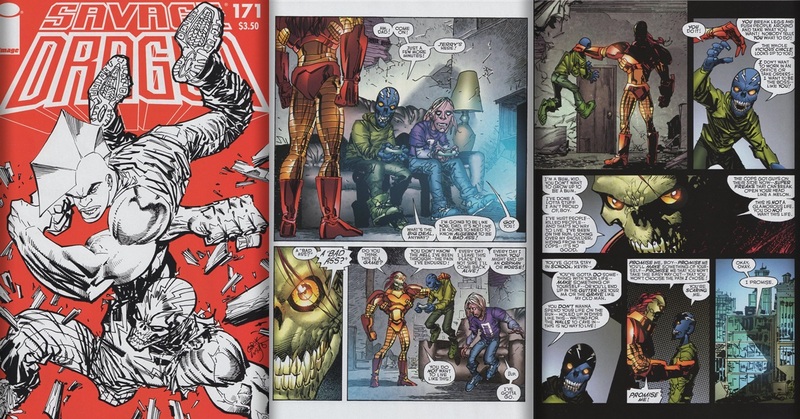 Despite this Skullface ensured that his son attended school and always did his homework [Savage Dragon #171]. Thunder Head could not understand why school was important because he wanted to join his father in a life of crime. His father warned him to stay away from a life of crime at all costs, David promised his dad before his death that he would stay away from crime [Savage Dragon #171]. Years later after his mother was killed he continued to stay away from crime. When he was fired because of his appearance despite being a good worker and got an eviction notice he thought all his sacrifice had been in-vain. He was recruited into the “Vicious Circle” when they promised they could resurrect his dad. While perpetrating a crime he fought Malcolm Dragon, his 1/2 brother. In this first encounter he managed to hold his own an escape [Savage Dragon #171]. He delivered the desired device to the Circle thus completing his mission [Savage Dragon #172]. While at the graveside of his father alongside Wargod, they were thwarted by Malcolm Dragon and his adopted sister. During the battle the “resurrection machine” was damaged and Wargod was killed. When Malcolm realized they were brothers he allowed the reluctant villain to escape [Savage Dragon #182]. While visiting his father’s grave he witnessed a resurrection of ‘The Claw’ [Savage Dragon #183]. He was pulled into Claw’s plot and was abused by him. When Claw was stopped Kevin was severely injured and had to be hospitalized. Malcolm and him bonded during his recovery. Though he was told he may never walk again he vowed he would recover [Savage Dragon #189]. After leaving the hospital he got a job in a restaurant and using leg bracers was walking again [Savage Dragon #190-193].